Three places where you can still pick up orders. 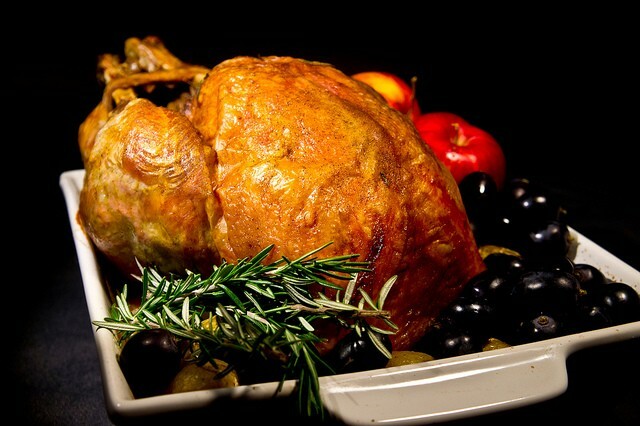 It's not too late to get your turkey from Clove & Hoof. Thanksgiving is a mere three days away — and maybe you still have no idea what you’re bringing to dinner. Don’t panic. There are still a few East Bay spots willing to help. Check out Clove & Hoof’s (4001 Broadway, Oakland) online holiday shop. In addition to free-range turkey, brine mix, and gravy, the indie butcher shop is selling some pre-made appetizers such as chicken liver mousse, pâté, and pork terrine loaded with black truffle. Pick up some crackers and you’re good to go. You have until Tuesday, Nov. 21, to pre-order from Flip ‘n’ Soul (2101 14th Ave., Oakland). This is a great option for huge gatherings, as the Filipino and soul food eatery is selling by the half tray (up to 20 eaters) and full tray (up to 30). Choose from more expected offerings like mac ‘n’ cheese, green beans, dressing, mashed potatoes, and candied yams, or go for Flip’s chicken adobo, pancit, or smothered pork chops. It’s too late to pre-order your meal from Market Hall Foods (5655 College Ave., Oakland), but the store should still have some items available. The full menu includes all the traditional sides, mains, starters, and desserts. Arrive early for the best selection. Most bakeries have closed pre-orders for pies, but PieTisserie (1605 2nd Ave., Oakland) promises to have plenty of options for walk-in customers this week. The Thanksgiving menu includes pumpkin in a chocolate crust, black bottom walnut, and spiced apple.